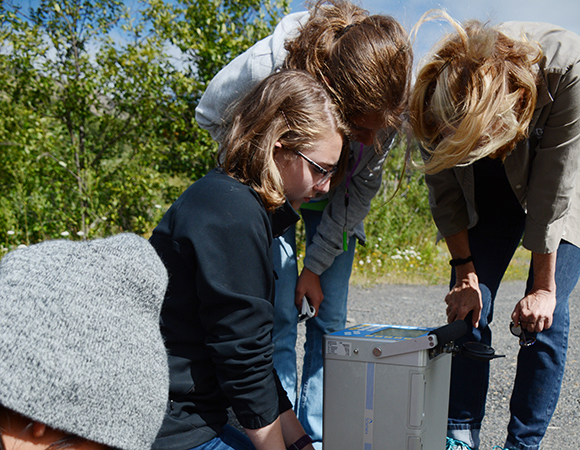 For its second year, UNAVCO participated in GeoGirls, a five-day science and technology field camp for middle school girls on Mount St. Helens. 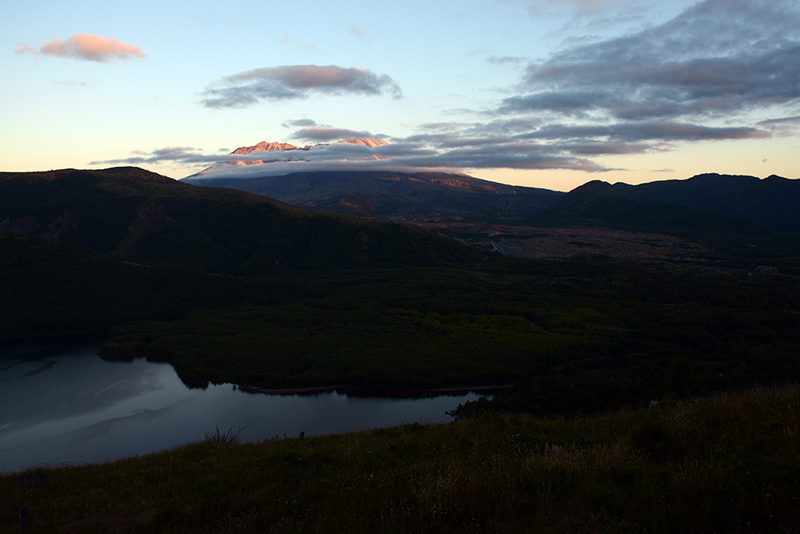 The program is run by the USGS and the Mount St. Helens Institute (MSHI), with the support of many partners. 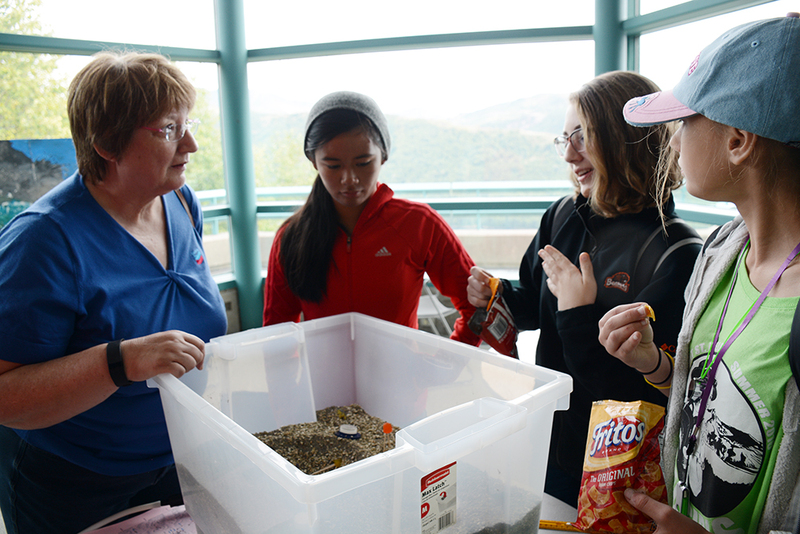 Eighteen middle school girls, four high school mentors, two middle school science teachers, and many volunteers and scientists participated. 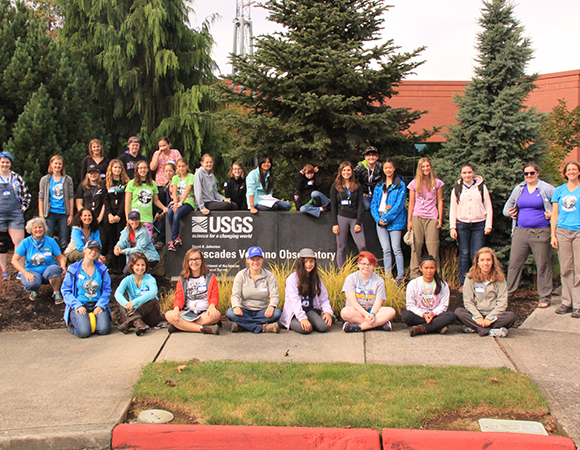 The camp starts and ends at the USGS Cascades Volcano Observatory in Vancouver, Washington. In between, the team spent two nights at Ridge Camp, used for research and other educational programs, and two nights at the Coldwater Science & Learning Center on the volcano. 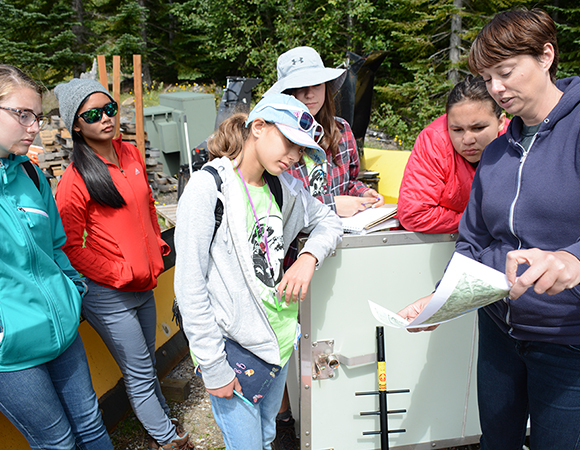 The girls learned about field methods such as stratigraphic mapping, toured volcanic features such as Ape Caves, and tried out geophysical methods such as geodesy and seismology. The course culminated in a crisis mission, where the girls worked together to assess and communicate a volcanic crisis. UNAVCO participated as a partner offering in-kind support, providing travel and time for two staff to join the program. Many secondary school students have very limited exposure to Earth science, especially as it is applied to societal issues. GeoGirls exposes young Pacific Northwesterners to a volcano in their backyard, and to how science helps mitigate the effects of the hazards that come with it. 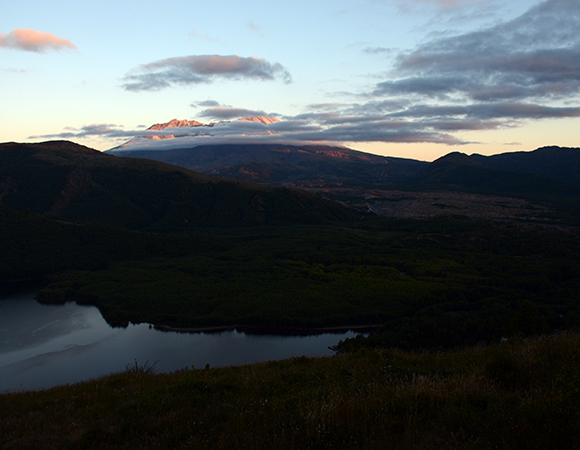 Mount St. Helens is one of several volcanic targets within the EarthScope Plate Boundary Observatory (PBO), with 8 tiltmeters, 4 borehole strainmeters, and 17 of its 24 continuous GPS stations installed and maintainted by UNAVCO as part of PBO. 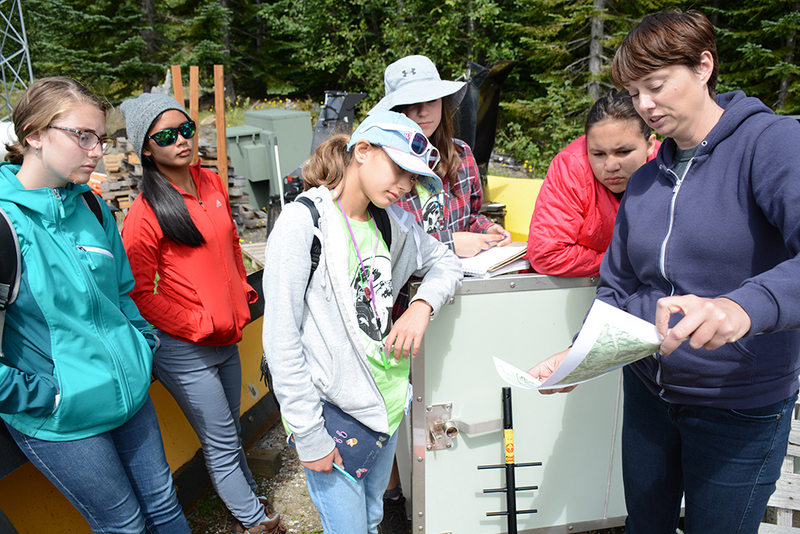 UNAVCO's participation in GeoGirls is an opportunity to leverage these resources to share the role of geodesy in volcano science with young, aspiring scientists. 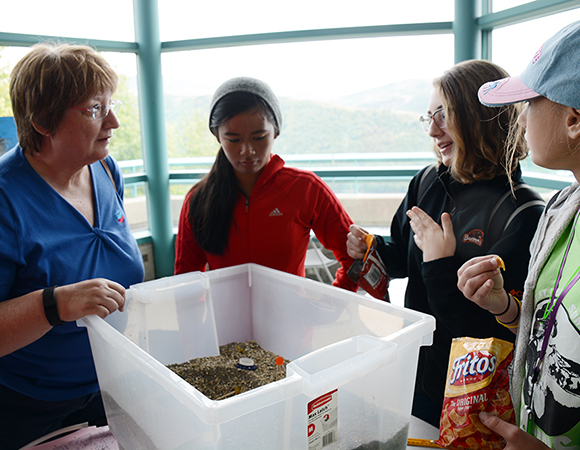 UNAVCO outreach specialist Beth Bartel joined the program for its entirety, serving as a science mentor to the girls in the program, sharing her experiences working on Mount Erebus volcano, Antarctica, and leading small groups of young volcano geodesists during the volcano crisis mission. UNAVCO borehole geophysics field engineer Liz Van Boskirk joined the program for a long day, sharing her experience as a graduate student in an eruption of Soufriere Hills volcano on Montseratt, with many pictures to illustrate the eruption's effects. Both Liz and Beth teamed up with USGS CVO geophysicist Evelyn Roeloffs to lead a small group of girls in a geodesy day including observations of a deforming sand volcano, a tour of an EarthScope Plate Boundary Observatory borehole strainmeter station, and a transect of gravity measurements up to the Johnston Ridge Observatory visitor's center. 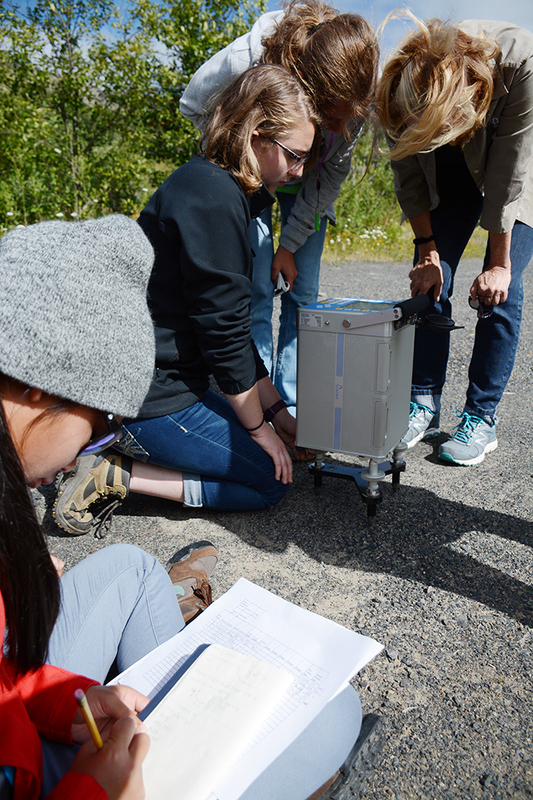 The girls came away with a better understanding of how instrumentation helps us to explore what in the Earth we cannot see, and how small motions at the surface of a volcano can inform us of big changes within.